Denny Jump (Bellevue, WA, United States) on 12 October 2010 in Landscape & Rural and Portfolio. Within Hidden Valley, a proliferation of Pinion Pine, Juniper, Scrub Oak, and other trees have occurred, partially because of the comparatively protected setting in which they exist. The added "greenery" along with the wonderful rockery makes for a delightful and easy hike. As we venture through the valley, it is easy to see why it was a favorite "hide-out" for cattle rustlers and the like. Also, the trail is very nicely marked with signage along the way to describe the different features found in the Valley. Soon, we will be bidding farewell to Joshua Tree National Park, however I still have a few more "treats" for you in the coming days before we conclude this series altogether. However, I do want to thank you very much for joining in this series! @Phil D. Morris: Hey Phil - thank you sir..I hope you are doing ok. This has to be a rough series for you to post...but the importance and the emotion of the series are necessary I agree!! All the best my friend! Denny, you placed that cloud in the perfect location! The colors are wonderful...and you can almost smell the fresh pine scent of the trees. This is a great picture! @Cruz: Hi Cruz - Thank you so much. I like this one, too. I almost zipped by it when I was going through my 300(+ -) images...I can't imagine having to move through 7,000! Good Heavens.. Yes, the air is great..I forgot to mention the air...I will make a big point on one of the next few day's posts. Thanks again Cruz! You have been a very good trail guide, Denny. It looks quite attractive and I would love to walk this trail. @Julie Brown: Proud to be your guide, Miss! A beautiful composition with the glory of Mother nature to the fore. The shadowplay adds so much to the frame, which is an absolute gem. @SOUL AFLAME: Hello sir - and thank you so very much for your wonderful comment. I really enjoy your work! @Tamara: Hi Tamara - Thank you so mudh - it is so nice to hear from you. I'm quite enjoying the series! :) Hopefully I can get to the desert one Spring! Beautiful light and sky, Denny. Well framed. @Stephen Phillips: Thanks Stephen! Daytime shot but we had fun!! This is quite reminiscent of Texas Canyon, an area of the Dragoon Mountains here in Cochise County Arizona. @Larry Elkins: Yes I'll bet it does, come to think of it..I have not been to Bisbee, specifically but I am somewhat familiar with the geography in that area through there. Had a friend named Mike Abbott I think used to live in Benson or Huachuca City somwhere around there...and I have flown through Huachuca Douglas City on my way to Basic Training at Ft Bliss wayyyy back in the late 60s and, finally, we lived in Glendale for a few years in thevery early 80's. Thasnk Larry!! Great composition and colours in this one. @Andrea: Hi Andrea!! Thank you so much..I really like your Birch Tree and clouds todayalso!! @Sunder: Hi Sunder - Thank you very much sir! Love the trees in this image. 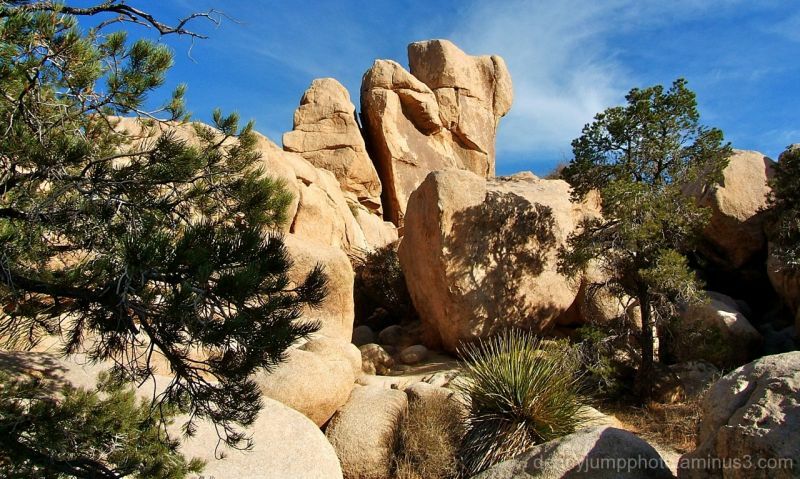 The boulders atop are beautiful offset against the sky. What a great spot, well framed and seen from your vantage point. Beautiful! @Bettina: Hi Bettina - I appreciate your always supportive comments...your work is so phenomenal I love it...Thanks buddy! @john4jack: Thanks Jack - I love yours for today..awesome! @JJ: Hi JJ - Thank you very much! The green trees, brown rock, and blue sky work together wonderfully. @Steve Rice: Hi Steve - Thank you very much;-) It is a wonderful place! another really gorgeous image Denny! @Becky: Hi Becky...Thank you so much. I just like places like this...they make me feel calm and I forget all the junk. I hope you guys are doing ok! Again with the light! Very nice. A great composition with plants of different shapes, sizes and textures. I love the shadows cast against the rock and the beautiful blue sky. @Steven: Hi Steven - Thanks again...yes maybe this one and tomorrow's a just a bit "busy" but that sure blows peoples images of the desert being barren, dead, open and all that other stupid stuff!! I am playing catchup again! Wonderful shot and lighting here Denny! Bravo! Love this! I'm viewing your series from back to front. Why? Who knows! Taking time now. I love this.